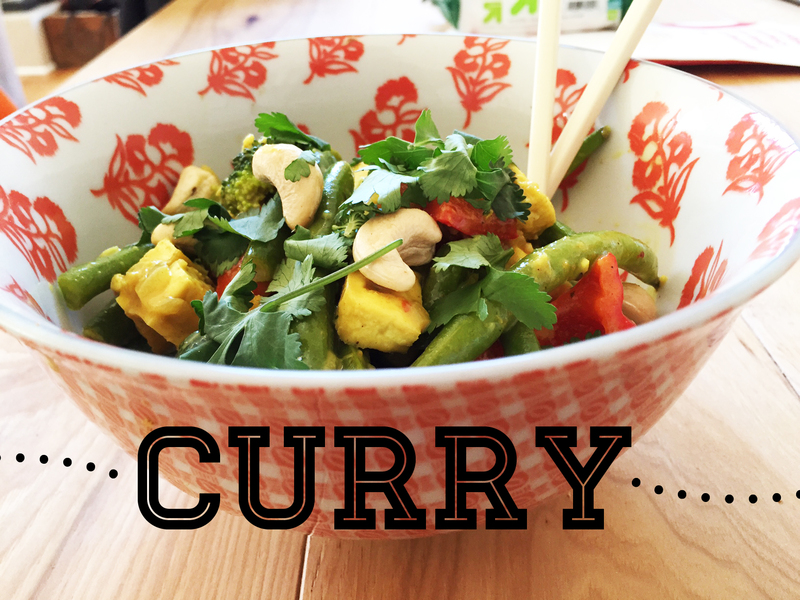 you guys, I MADE A CURRY! and it tasted good!!! I have the hardest time with curries, every so often i get the urge to make one and its just so bland, so I’ve pretty much given up on it. But something inspired me to try it again. After looking at a few recipes on the internet, I got the basis down and decided to go my own way and just make something up. Feel free to use whatever vegetables are in season or you have on hand. First – Prep your tofu. Set your oven to 400 degrees; cut into 1 inch cubes, put on baking sheet and bake 10 minutes. flip over and bake 10 minutes more. set aside. Finely chop your onion, garlic and ginger Using about 2T coconut oil, sautee them in a large pan or saucepot. Once onions start to soften, add the curry powder and a 1-2 T water to deglaze the pan so nothing burns. Add the bell pepper and green beans and saute for a few minutes. pour in the coconut milk and add the tofu and let simmer for about 3-5 minutes. Add about 1/2 tspn or so of salt to help bring the flavors out in the vegetables. Add the brocolli and greens and cook for a few minutes more, until your vegetables reach your desired firmness. Squeeze the juice of half a lime over the curry. Let stand for a few minutes to let the flavors meld. Spoon on top of some rice, and top with cilantro and cashews. I sprinkled some simply asia ginger and garlic seasoning on top of mine. Definitely adjust the seasonings to your liking, and feel free to customize with any you might think are good. This is a great recipe to start with and build on to make better and better each time. Is your kid mine-craft obsessed like mine??! 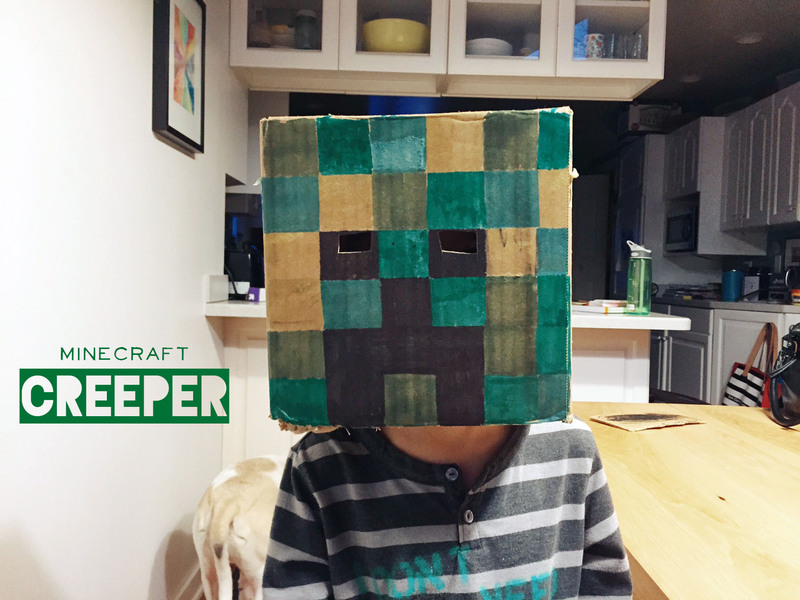 I dont know what hes more crazed about – watching the videos on you tube, or actually playing the game….I got this perfect sized box to fit right on my kiddos head, so we made a creeper out of it. We used masking tape and all our green shades of prismacolor markers to make it work. We taped off the squares, one by one, which worked as a good guide for milo to color in the squares evenly. We looked at a pattern online of the creeper so we would have an idea where the eyes would go. When we were finished we cut out squares in the eyes so he can see. I tried this recipe to make cheesecake. Now, mine not have turned out to be the prettiest, but it defintely tasted good. Its really rich and decadent and tastes alot like the real thing, from what I can remember. My non-vegan friends loved it as well! Place the whole cookies (filling and all) in a food processor or blender and pulse until the cookies resemble a coarse crumbly flour. Add the coconut oil and pulse for another second or two to combine. Press the cookie crumb crust into an 8″ springform pan. Distribute evenly across the bottom and up the sides of the pan. Set aside. Place the cashews and the coconut milk in a vitamix or high powered blender. Pulse the food processor for several seconds to break down the cashews. Pulse until smooth and creamy. Add the vegan cream cheese and extra firm tofu and pulse again until smooth and creamy. Next add the sugar, corn starch, margarine, and vanilla. Pulse for several seconds, up to a minute until you have a nice, creamy mixture. Add the 10-12 roughly chopped Oreos and give it one more stir to combine. Set aside. Turn your oven to 325F while you let the filling settle for a few minutes. 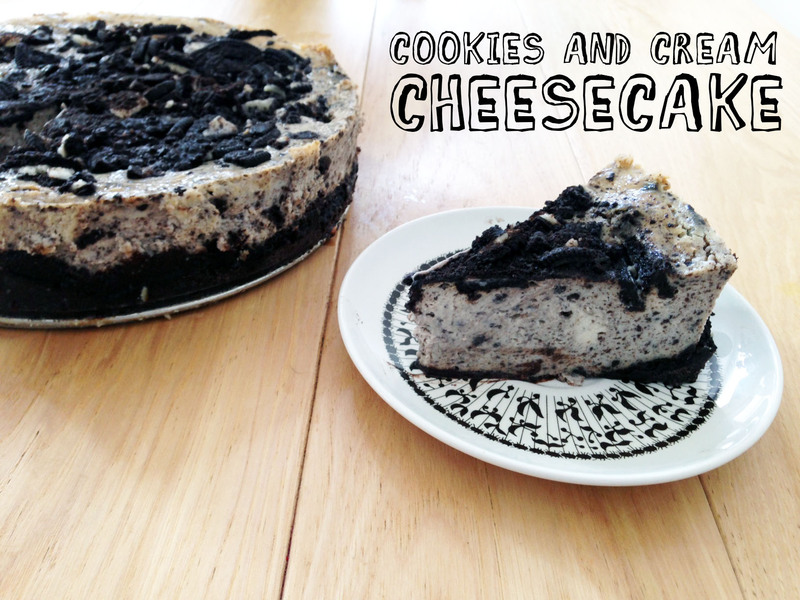 When the oven is ready, pour the cheesecake filling into the prepared crust and spread the 10-12 roughly chopped Oreos over the top. Bake your cheesecake for 60 minutes and then turn the oven off and leave the cheesecake in the oven for another hour. 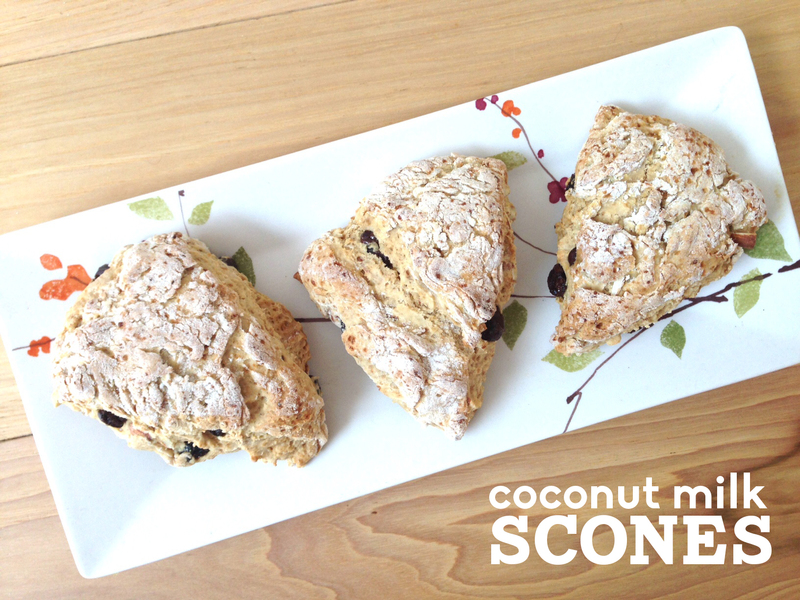 Remove from the oven and allow to cool before placing in the fridge. I recommend letting the cheesecake cool for at least four hours (or even a full day) before slicing and serving. So I thought I was in the home stretch as I approach what I THOUGHT would be the last row of the blanket. The more I look at it, and the more I think about it, I’m going to just go for it and make it bigger. I’m planning one more row across down, and three more across. Which means I have about 50 more squares to make and a few more skeins of yarn to buy, since Im ran out of quite a few colors. I figure, if I’m going to do this, might as well DO this, am I right?! So I definitely have my work cut out for me, but this is such a fun project, I’m ok with it. Hopefully a few more weeks of work cut out for me, but photo sessions are starting to pick up, and we have some travel in our future, so we shall see….